Traditional methods for handling spatial data are encumbered by the assumption of separate origins for horizontal and vertical measurements, but modern measurement systems operate in a 3-D spatial environment. 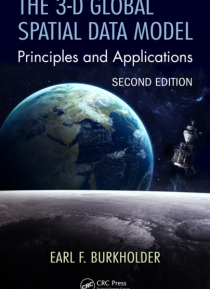 The 3-D Global Spatial Data Model: Principles and Applications, Second Edition maintains a new model for handling digital spatial data, the global spatial data model or GSDM. The GSDM preser… ves the integrity of three-dimensional spatial data while also providing additional benefits such as simpler equations, worldwide standardization, and the ability to track spatial data accuracy with greater specificity and convenience. This second edition expands to new topics that satisfy a growing need in the GIS, professional surveyor, machine control, and Big Data communities while continuing to embrace the earth center fixed coordinate system as the fundamental point of origin of one, two, and three-dimensional data sets. Ideal for both beginner and advanced levels, this book also provides guidance and insight on how to link to the data collected and stored in legacy systems.